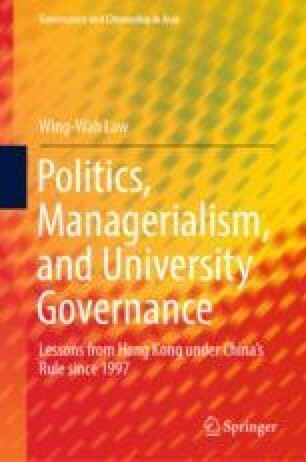 This chapter first examines how the changing domestic political context has confronted Hong Kong higher education institutions and their governance, particularly during HKSARCE C. Y. Leung’s tenure. Specifically, it focuses on two definitive political events in post-1997 Hong Kong—the 2012 anti-national movement and the 2014 Occupy Central—that revealed significant differences between the political ideology of many Hong Kong people and the central and Hong Kong governments, regarding the “one country, two systems” framework, and involved students’ and academics’ civic engagement in political movements as a means of negotiation, to test the authorities’ bottom lines, and to curb government initiatives they deemed unacceptable. However, the two events fostered greater distrust between the central government and Hong Kong people, and further revealed that governments ultimately determined what type and extent of civic engagement was acceptable and would be tolerated. Browningsun. (2014, September 19). A talk with the President of HKUSU Leung Lai-kwok, Yvonne. Retrieved from https://hongkongwatch.wordpress.com/2014/09/19/a-talk-with-the-president-of-hkusu-leung-lai-kwok-yvonne/. Commissioner’s Office of China’s Foreign Ministry in the Hong Kong Special Administrative Region. (2014, November 5). Over 1.8 million HK citizens sign against occupy central. Retrieved from http://www.fmcoprc.gov.hk/eng/xwdt/xjlc/t1207234.htm. Democratic Alliance for Betterment of Hong Kong. (2014, April 22). Proposals of the 2017 chief executive election and 2016 Legco election. Retrieved from http://www.dab.org.hk/eng?st=22&t=5&m=1&n=1669. Eighteen Scholars’ Proposal. (2014, April 4). Achieving true democracy under the Basic Law. Retrieved from www.facebook.com/ScholarProposal. Fung, F. W. Y. (2011, May 12). State brainwashing perfectly all right, liaison official blogs. South China Morning Post. Retrieved from http://www.scmp.com/article/967464/state-brainwashing-perfectly-all-right-liaison-official-blogs. Hong Kong Government. (2012a, October 8). Curriculum guide of moral and national education subject formally shelved. Retrieved from http://www.info.gov.hk/gia/general/201210/08/P201210080622.htm. Hong Kong Government. (2012b, October 8). Transcript of remarks by Secretary for Education and Chairperson of Committee on initiation of moral and national education subject. Retrieved from http://www.info.gov.hk/gia/general/201210/08/P201210080646.htm. Hong Kong Government. (2014b, July 15). Transcript of remarks at press conference on release of constitutional development public consultation reports. Retrieved from https://www.doj.gov.hk/eng/public/pr/20140715_pr1.html. Mathieson, P. (2014, September 29). Message from the President and Vice-Chancellor. Retrieved from http://www.hku.hk/press/news_detail_11745.html. Public Opinion Programme. (2014, June 29). Results of “6.22 Civil Referendum”. Retrieved from http://hkupop.hku.hk/english/release/release1164.html. Xi, J. (2017, July 1). Address at the meeting celebrating the 20th anniversary of Hong Kong’s return to the motherland and the inaugural ceremony of the Fifth-Term Government of the Hong Kong Special Administrative Region. Retrieved from http://news.xinhuanet.com/english/2017-07/01/c_136409940.htm.